Archery as a sport is increasing in popularity as the years go on. Not only is it a great sport because it requires a lot of strength and skill, but it is an activity that can be enjoyed by all of the family. Gone are the days of a few available bows to choose from, archers and potential archers are swamped with choices! Whilst compound bows may look daunting to the novice, they are great for anybody. Whether you’re looking for the best compound bow for hunting, a women’s compound bow or even the fastest compound bow, you can find all of these options available to buy these days. At Stuffoholics, we’ve looked at a massive number of compound bows in all categories. So, if it’s a compound bow you’re after, read on! Why Is a Compound Bow Better? Trust is a big issue when reading online recommendations and buyer’s guides. Recently, I read an article about a well-known travel review website, which claimed that 50% of the reviews weren’t real – that’s a scarily high number! You don’t have to worry about that with us at Stuffoholics! We pride ourselves on our authenticity and accuracy. 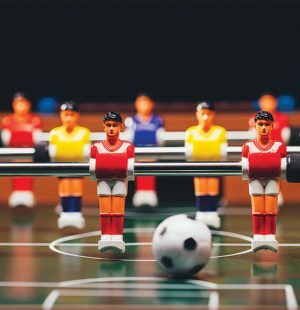 For starters, we have tons of experience in running methodical product research. We’ve been doing this for well over 5 years now and have one sole purpose: giving you, our readers, information that will help you choose the product that is right for you. We ensure we remain objective and without any bias by involving other people in our process and eliminating any reviews that are subjective or show bias. We also review many different compound bow brands of the product, which proves that we’re not trying to promote any specific brand in this guide. Hopefully, all our readers will find this guide useful. We have made sure to include picks for all kinds of users, ranging from beginner archers, hobbyists and professionals so whoever you might be, this review will help you. The traditional bow – think of the bow and arrow you see in historical films or imagine Robin Hood and you will know what I mean when I talk about the traditional bow! These bows aren’t fancy or technological and they don’t have gadgets or aids. Like the bows before them in history, they simply rely on their archer’s skill to operate. Recurve bows – the clue is in their name! They are named due to their different shape. A recurve bow will have limbs that curve towards you, like a traditional bow, but the ends will curve outwards. This design means that a recurve bow is much more powerful than a traditional bow. These are ideal for beginners as the shooter doesn’t need to be particularly strong to use one. Takedown bows – A takedown bow is a recurve bow that can be taken apart for transportation or storage. They aren’t particularly expensive and are pretty easy to use. An archer has lots of options available to him with a takedown bow as parts can be replaced or swapped really easily. This type of bow is used in the Olympics. Longbows – this type of bow dates back to the 13th century. They are made simply for a long piece of wood that is curved. Due to the fact they don’t have arrow rests or sights, they are more difficult to use and master. They don’t have the same level of speed as other bows. Compound bows – these are widely used in archery target practice and hunting and have become the most widely-used bows in the United States. The compound bow uses a levering system to operate. There are usually cables and pulleys that bend the limbs of the bow, which makes it much more energy efficient than other types of bow. These are much more high-tech than other bows. Yumi bows – Yumi bows are Japanese bows used in Kyudo, which is a Japanese sport similar to archery. The bows are made from a bamboo and wood mix and are usually much taller than the average Japanese archer. Reflex bows – These bows have curved arms which turn away from the archer. Unlike the recurve bow, a reflex bow turns out along its whole length. Owing to their unique shape, they can be a lot smaller than a recurve bow or a longbow and still maintain the same power and speed. Crossbows – These are seen more as weapons than anything else and surely, there are differences between crossbows vs compounds. Crossbows have a long history, although they don’t date as far back as the traditional bow. What set them apart from their traditional partners is that they are much easier to operate and don’t require as much skill from the archer. They were also very simple and cheap in comparison, meaning that lots of soldiers could be quickly trained up to use them. Nowadays, crossbows aren’t used as often in warfare but they are still used in sports and hunting. In the early 1960s, the US saw the rise of interest in hunting with bows. Kansas-born Holless Wilbur Allen was a keen archer who was very technically minded. He decided to experiment by sawing off the ends of the limbs of a recurve bow and added pulleys. This was finally patented on June 23, 1966 and he then went on to manufacture compound bows. Compound bows have a riser that is made from aluminum, a magnesium alloy or carbon fiber. The riser is located in the middle section of the bow where the bow is held by the archer and is designed to be inflexible. The limbs extend from the riser. With a compound bow, the limbs are designed to take a lot of force and are therefore constructed from composite materials with a high fiberglass content. This is because the limbs store all of the energy of the bow. They flex when the bow is drawn and take the energy, which is then passed on to the arrow. The bowstring needs to have a high tensile strength and shouldn’t be elastic. This is so that most of the energy is transferred to the arrow. Originally, the bow cables were constructed from steel coated in plastic. Nowadays, we see them being manufactured from ultra-high-molecular-weight polyethylene (UHMWPE), which is highly resistant to abrasion, is self-lubricating and has extremely low moisture absorption. Normally, a compound bow has a wheel at the end of each limb. These are called cams and they are designed so that the bow has a “let off” at the end of the draw. The “let off” is around 60% to 80% of the draw weight. So, if you have a bow with a 70lb draw weight and a let off of 70%, the archer only has to hold 21bs. This means that he can hold the draw for longer, allowing more time for a better and more accurate aim. In addition, compound bows release arrows at much quicker speeds. Not only does this mean that the arrow hits the target with more power (this is useful when hunting), but the arrow will travel along a flatter curve, enhancing its accuracy even further. It is important to choose arrows carefully for your compound bow and there are many things to take into account. Safety is paramount so it important to do research. Some arrows will not be strong enough for use with a compound bow and may, therefore, cause injury. It is important the arrows are not too short. If an arrow is shorter than the draw length of your bow, then this could cause it to break and cause injury. It would be a good idea to ask an expert or see if your bow comes with any recommendations. Apart from the obvious difference in looks, a compound bow has many differences in its features to other types of bow. 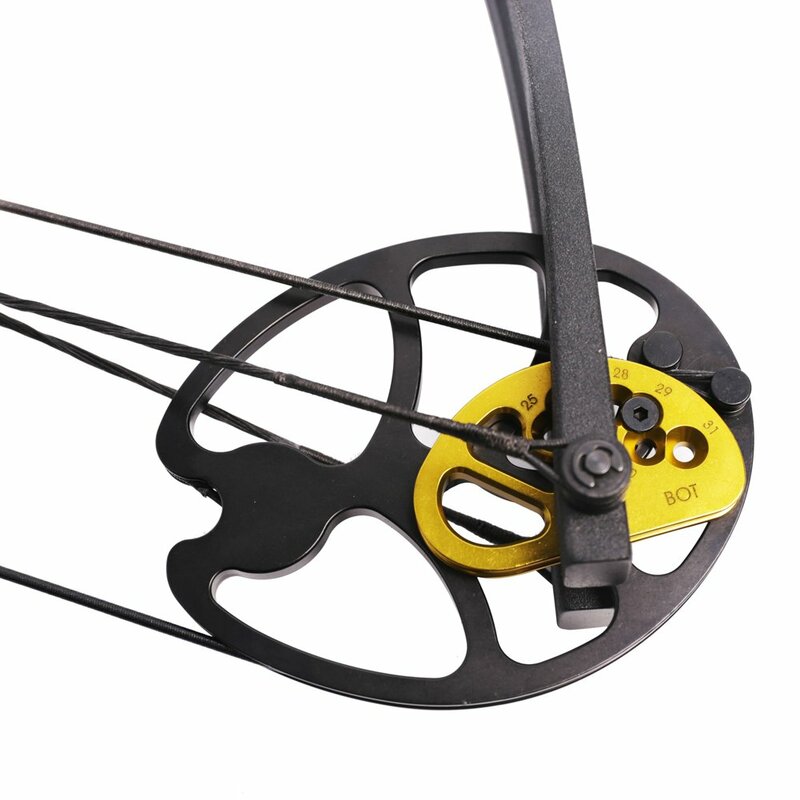 Unlike all other types of bows, compound bows have a system of cams and pulleys. These increase the accuracy and power of the bow, thus we can decipher that compound bows are more powerful and accurate than other types of bow. To look in more detail, the compound bow differs in how it delivers power to the arrow and how the archer releases the arrow. Normally, in other types of bow, the string is harder to pull depending on the weight of the bow, which means it is limited by the archer’s strength. With a compound bow, the cams rotate when the string is pulled, meaning that after a certain point the weight comes off the string. With this bow, archers can hold the bow at full draw for a lot longer, thus providing the opportunity for a more accurate or more timely shot. With these features, compound bows generally come at a higher cost than other types of bow and require a bit more maintenance. Recurve bows are usually lighter and more compact than compound bows but they definitely require more skill, practice, and technique. The recurve bow’s use relies entirely on how strong the archer is. Unless the archer has exceptional upper body strength, he or she will find using a recurve bow more difficult than a compound bow. The archer also needs to be a lot closer to the target. However, because they are a much simpler design, many people prefer them. They look closer to a traditional bow too and have fewer mechanisms to maintain and check. Compound bows require much less practice for the accuracy of shots. An archer can have much weaker upper body strength but still be able to shoot very powerful and accurate shots due to the cam and pulley system. 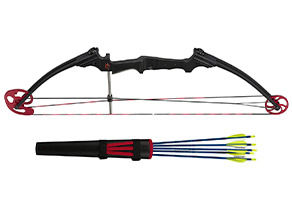 For the more professional user, these bows can be customized and tweaked to ensure maximum performance. Those looking for a more traditional bow and arrow experience might be put off the modern look of the compound bow but that’s about its only disadvantage in comparison. Compound bows can be for anyone; although the maintenance and look of them might put off novices, there’s no reason they should. A compound bow can be a great way of getting into archery or hunting. Since they’re easier to use and more accurate, novice archers find they can begin shooting arrows and get a sense of satisfaction straight away. It could even lead to beginners going down the more traditional bow and arrow route. If you’re wanting the best hunting bow, then the compound bow would be a better option since the draw is lighter and more powerful. You would be able to maintain the bow at full draw for longer and could, therefore, wait until the most opportune time to take your shot. Also, you can move more easily when compound bow hunting as they are smaller and easier to carry around. Choosing a compound bow can be quite tricky if you’re not sure what to look for or if you’ve never bought one before. Draw Length – Firstly, you need to work out your draw length. This is especially important when choosing a compound bow because, unlike other types of bow, compound bows are designed to only draw back so far. The compound bow will come with a specified draw length so you need to make sure it’s appropriate and right for you. Additionally, compound bows should only be shot when at their maximum draw length, which is why it’s even more important to ensure you’ve got the right measurements. There are many ways of calculating and measuring your draw length, so make sure you do your research and measurements accurately. It could be that your maximum draw length is calculated to be 29 inches but you feel better or shoot better at 28 inches, in which case you should opt for a bow with a 28-inch draw length. Draw Weight – Another thing to consider is the draw weight of a bow. The draw weight is the force needed to pull back the bowstring. Unlike a traditional bow, the draw weight of a compound bow doesn’t get progressively more difficult the further back the string is pulled, although in most cases, the string is slightly easier to pull and the beginning and end of the draw. The compound bow’s draw weight is calculated at the heaviest part of the draw when it demands the most effort from the archer. Choosing a draw weight depends on what you want from your bow but it’s advisable to choose a draw weight that means you’re pulling at about 75% of your maximum during the shot. This way you won’t get overtired after just a few shots. If you’re new to archery you will build up strength in the muscles used to draw the arrow, which means you’ll find it easier to pull with time. Most bows come with an adjustment of 10lbs draw weight should this happen; thus you can increase the weight as you get stronger. Axle-to-axle length – This is another thing to consider when making your choice and you need to take into account the purpose of your compound bow. If you’re hunting in small spaces, you will probably be better off choosing a bow with a shorter axle-to-axle length given that you will be likely using it in small spaces. 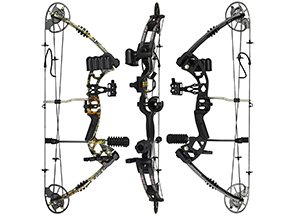 Accessories – Compound bow accessories are something to consider too. You might want to consider a compound bow that comes with a bow quiver or a bow that can easily have a quiver attached to it. A bow quiver is a storage place for your arrows on the bow. With some bows, you can attach a quiver to the riser. This is called a two-piece quiver and is usually specific to the brand and model of the bow. It is a good idea to look for a compound bow case when purchasing your bow for easier transportation. Bow Weight – Finally, it’s a good idea to look at the total bow weight, especially if you are going to use the bow to hunt. Both lighter and heavier bows have their positives and negatives. A lighter bow will be easier to maneuver around the woods for example, but being lighter also means it would be noisier due to added vibrations. Heavier bows are the opposite. They are quieter but are obviously more difficult to transport. Target archery – this is the type of archery you will see in the Olympic Games. It is the game that people are most familiar and have most likely tried out of all the other types of archery. Target archery can be both an indoor and outdoor sport, with archers shooting a set number of arrows at a target. The targets are usually at set distances over a flat surface. Field archery – unlike target archery, field archery takes place in woodland or uneven terrain. There is a sequence of targets throughout the course, which are different sizes and at different distances so arrows will have to be shot uphill and downhill as well as flat. The game is a bit like golf in that respect! 3D archery – as the name hints, archers have to shoot at three-dimensional targets. This is a particularly good activity if you’re intending to hunt but is interesting for any type of archer. 3D archer also has the added difficulty of not having distance indicators, so archers have to estimate how far they are away from the targets. Traditional archery – although this means different things to different people, some opting for completely traditional bows and arrows as you would have seen in the Robin Hood era, others allow newer equipment but with limits on tuning equipment like sights or stabilizers. Bowhunting – this is the oldest form of archery. Many people who hunt with rifles often like to turn their hand to bowhunting as it requires more skill. There are lots of different points available. Many are already attached a shaft put you can buy points that attach to different shafts too. Points come in different styles from the following: bullet, field, blunt, grabbing, fishing and broadhead. In terms of shaft types, the most expensive is usually made from an alloy core with a carbon cover. This makes for a lighter but stiffer arrow. These are often used by professionals and Olympians. You can also get shafts that are made entirely of carbon. This makes it light but also less stiff than other types of shaft. For beginners, aluminum shafts are great. They are usually heavier, which means they travel for shorter distances at lower speeds. They are also cheaper. Wood is the first thing that comes to mind when thinking about traditional archery. They are cheaper and easily disposable. You can, of course, customize your arrows or buy them ready to use. Ready-made arrows are usually cheaper and better for beginners. The most basic and traditional bows are made from a single piece of wood with a string attached to each end. It is very easy, however, for these bows to become misshapen, for example, if they absorb too much moisture or get too cold. To avoid this happening, most modern bows are made using composite materials and use a mixture of carbon fiber, fiberglass, and wood. Traditional arrows were also made from wood shafts but more recently they are constructed from hollow materials like aluminum and fiberglass. The feathers were traditional from turkeys but nowadays are mainly plastic. The heads of the arrows are made from steel these days but were, in the past, made from substances like flint and bone. In terms of bowstrings, for compound bows, the strings are usually made from steel wire. Other types of bow tend to use linen thread, particularly longbows. The traditional materials used were often animal-based like sinew or rawhide. Other naturally occurring substances like flax, hemp, and silk were also used. It is actually easier to make your own bow and arrow than understanding the phenomenon known as the Archer’s Paradox! Firstly, you need a tree that is at least 8 inches in diameter. Hickory, oak, and maple are usually the best choices. You need to cut and split the tree. It is important to leave at least 6 inches at the end of the stave so that you can cut off any cracks in the wood. The stave needs to be one-inch-wide and 1 inch thick. A really important but time-consuming step is to let the wood dry out properly. Three or four weeks is usually enough but it could take up to 12 months! If you have a moisture meter, you’re looking for a reading of about 12 percent. Once dry, the bark needs to be removed with a draw knife then the shape can be refined with both the draw knife and a pocket knife. You should aim for the middle section of the bow, where you will hold it, to be ¾ inch thick for about 5 inches. The ends should be tapered off to be ½ thick. The string grooves at the ends of the bow can be made using a chainsaw file and they need to be made at a 45-degree angle at half an inch from the end. After sanding, place the bow vertically on the ground and force it to form a small bend. When you’re happy with your bow and how it bends, it should be stained and treated to make it durable. Then it’s ready to be strung! At Stuffoholics we like to make sure we are thorough in all that we do. To find the ten best compound bows of 2018, our research and testing process was very extensive indeed! The first part of our process was to read thousands of user reviews on different compound bows to see what users were saying about what they wanted and got from the bow they bought. In total, we read over 3600 compound bow reviews, which took us a very time-consuming 72 hours altogether. Imagine trying to do all that research by alone! There were more than 10 compound bow brands we read reviews on and from those brands we looked at 35 different products. Our shortlist products took us down to 22 different compound bows but we needed to whittle them down to a Top 10. With the 22 bows in our shortlist, we then visited their websites and trawled through their guidebooks. We also read descriptions of them from multiple sources on the internet and again, looked at individual critic reviews to be sure of the kind features each bow comes with as standard. Our process also involved us comparing the products side-by-side so we could see how their features differed. We got a group of volunteers to rest and review the products and we matched their experience to the experiences of the review-writers from our initial research. Finally, we were ready to finalize our Top Ten Products and we now present them to you. Below, you will find what we consider to be the best compound bow available right now as our Top Pick. We also have a budget pick, which isn’t necessarily about cheap compound bows, but inexpensive bows that are good value for money. In addition, if you’re looking for a cheap bow and arrow for a child, we have made sure to include kids compound bows in our process and you will see which one we consider to be the best in our list below. So, without further ado, here is our Top Ten Product List of 2018. When comparing the 22 compound bows in our side-by-side analysis, we have considered 23 features for evaluation. These features provided an analytical result which helped us to shortlist the 10 best Compound Bow among our shortlisted 22 bows. 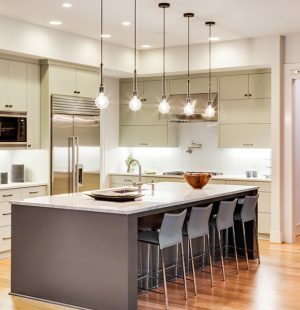 The features that we discuss were taken from each product’s manual and specification sheets. Furthermore, as money is a key factor when choosing a compound bow, we have gone through each bow’s pricing in order to find the value per dollar of each product and its features. Finally, we made sure to consider each product’s life cycle in terms of review frequencies to determine any misconception. Therefore, we are confident that we are providing an accurate review of the best products available in 2018. While bows, especially compound bows, need frequent maintenance and replacement parts from time to time, we are not going to discuss this. Our primary purpose is to talk about new bows or optional accessories that can improve your archery experience so you will not find reviews on replacement bowstrings or additional limbs for different draw weights in this review. For a further understanding of the features that we discuss and compare, please refer to our attached research report. Before I begin with the specifics of this review, I’ll explain why this is our Top Pick. The Raptor Bow stands out with its draw length that’s fully adjustable from 24.5 to 31 inches, making it a great bow kit for both adults and kids. It’s a bit on the expensive side at around $240, but definitely worth every penny. After analyzing the 23 different features amongst the products we selected to review, this compound bow had the highest number. It has 14 positive features, which include built-in stabilizers, rod dampers and string dampers. It comes with everything you could ask for or want from a compound bow. In terms of cost, we found this product on sale for around $240, which is above the average price of compound bows on the market. The average price of a similar kind of bow is around $180. 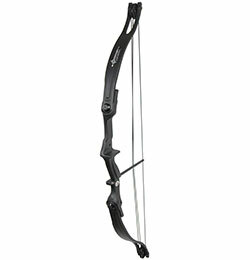 However, the price didn’t put us off considering it the best compound bow as you will see. There was a clear indication that people who had bought this bow were clearly satisfied with it. The average rating of each review was more than 4 out of 5, which is excellent. Furthermore, on Amazon alone, the Raptor Compound Hunting Bow Kit had around 176 reviews at the time of research. The review frequencies were also good. It had received its last 10 reviews over a period of 42 days. Prior to that, it had 10 reviews in 46 days and 10 reviews in 21 days. By this, we can assume that a lot of people are buying this product and are buying it quite often. Not only that, but they are positive about it too. We did, however, find other compound bows that had a higher number of reviews but these were much slower selling, which therefore means they are not as popular. Finally, we think it’s important to point out that this compound bow has a fully-adjustable draw length from 24.5 inches to 31 inches, with a draw weight of 30 to 70lbs. This means that not only is this product great for adults, but it makes for a great youth bow and arrow kit too. This bow can be adjusted for almost any size person in a matter of minutes! 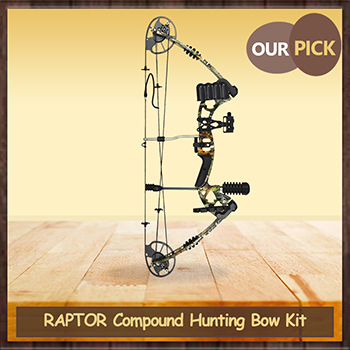 The Raptor compound hunting bow weighs 3.6lbs with an aluminum riser and cams. There is no plastic at all in this bow, unlike many other bows of a similar price. The limbs are made from fiberglass and there is both a string damper and a rod damper too. This is a right-handed compound bow with an arrow speed of 315 FPS, making it the fastest bow in our Top Ten. In terms of draw weight and draw length, it offers the biggest range available out of all the products you will see in our review. The draw weight can be adjusted to between 30lbs and 70lbs and the draw length can range from 24.5 inches to 31 inches so it is suitable for everyone. The brace height of this bow is 7 inches, and the axle-to-axle length is 30 inches, which means it’s in the middle in terms of size of all the products in our Top Ten. This compound design means that it has a 75% let off, which means you only have to hold 17.5lbs in order to pull 70lbs! 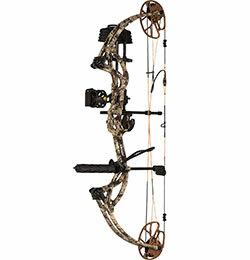 This bow comes with a bow quiver holder and a stabilizer holder as well as a 5-pin sight. The sight also has a light and a level and the sight and loop are already pre-assembled. There is also a whisker-biscuit style rest. Finally, there is also a split-yoke tuning system. This means you can make precise adjustments in order to get your arrows to fly well. At just under $240, this product comes with a 1-year warranty. Whilst on the more expensive side, it is certainly not the most expensive product in our Top Ten and its price is definitely worth it for the value you get. It has an average rating of 4.4 out of 5, coming from 176 reviews. It also has a really good review frequency, which shows that not only are people buying this product, but they are happy with what they get when out in the wild. An excellent all-rounder, the Raptor really lives up to its reputation and is, according to us at Stuffoholics, the best compound bow of 2018. This compound bow packs quite a punch even with its affordable price. It works well for both lefties and righties, and is lightweight and silent and perfect for beginners. For our Budget Pick, we’ve gone for the Leader Accessories Compound Bow. When looking for cheap compound bows, you might think that $125 is still on the expensive side, however, this is the lowest-priced product among the others in our Top Ten and is a great product in its own right. It still has all of the necessary features like an adjustable draw weight between 30 and 55 pounds and an adjustable draw length of between 19 and 29 inches. Moreover, this product is made with an ABS-type material with an aluminum riser. Finally, it has 11 positive features, which pitch it as the third highest in our Top Ten so we’ve put it in our second spot as our Budget Pick. In terms of reviews, it has an average rating of 4.3 out of 5 on Amazons at the time of research, coming from around 110 reviews. As far as review frequency is concerned, the most recent 10 reviews were submitted during the last 48 days, the 10 previous reviews in 46 days and the 10 reviews before that, in 37 days. By this trend, we can see that it has a similar review frequency to our Top Pick and is therefore just as popular on the market. Finally, this bow is lightweight if we compare it to our Top Pick. It is easy to use and reliable. 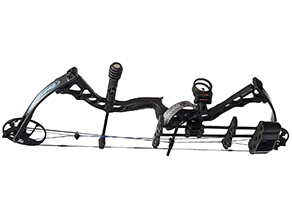 What is more, it is precise and silent, which means it will definitely be the best choice as a beginner compound bow. Weighing 3.3lbs, it is lighter than our Top Pick, has an aluminum riser with the limbs being made out of ABS, which is a durable plastic material. Like our number one, it has a string damper and rod damper. The lefties amongst you will be pleased to know that our Budget Pick can be used by both left-handed and right-handed archers. This is an advantage over our Top Pick, which is only suited to right-handed archers. The Leader Accessories Compound Bow has an average arrow speed of 296 FBS, which is slightly less than the Raptor. In terms of draw weight, this can be adjusted to between 30 and 55lbs. The draw length can also be adjusted to between 19 to 29 inches. Both of these adjustments can be made with an Allen wrench. Like our Top Pick, it has a brace height of 7 inches but has a slightly shorter axle-to-axle length of 28 inches. The let-off percentage is ever so slightly less too, at 70%. 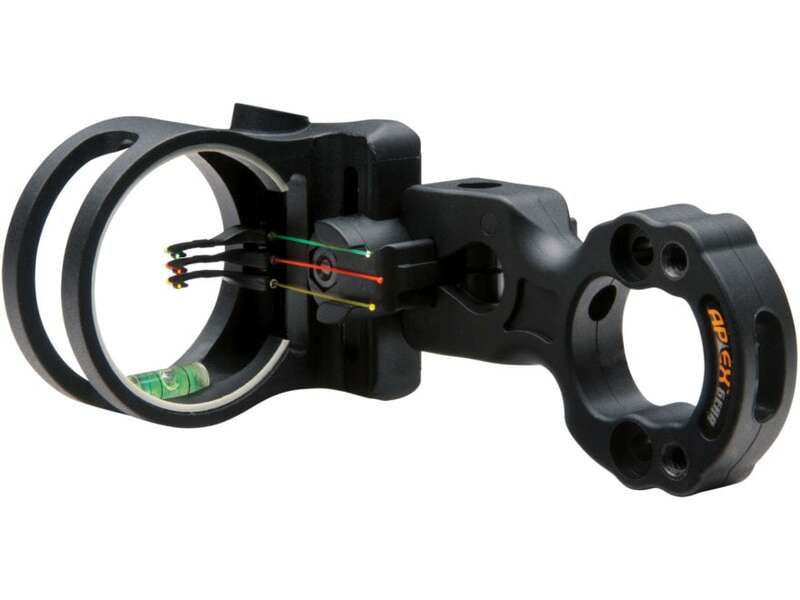 Our Budget Pick comes with a bow quiver holder but doesn’t have a sight holder nor stabilizer holder. 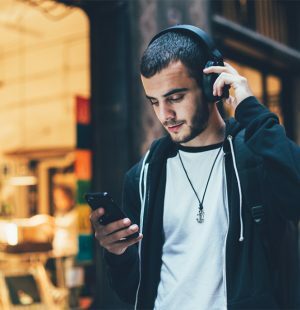 As previously discussed, the review score and frequencies are very much comparable to our Top Pick, which is one of the reasons this product features so high up our Top Ten list. It comes with a 1-year warranty on the bow. This excludes the string and cables, however. 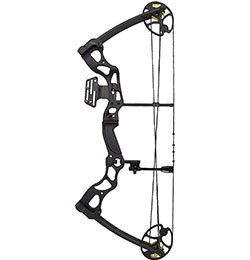 It is priced at around $125, making it the most affordable compound bow in our Top Ten. There are, of course, cheaper options available but as a Budget Pick, we need to compare value for money and quality. With this compound bow, you get a lot for your $125. So, it is a great place to start for a beginner compound bow user. This bow boasts of a lightweight construction, a lightning speed of 315FPS, and a draw length that can be adjusted from 12 to 30 inches. It’s the perfect bow for competitive and professional archers. More suited to professionals, our Advanced Pick is great for those who what to take archery to the next level – to real hunting and competition. This compound bow comes ready to hunt as it is equipped with six Trophy Ridge accessories so you can really see why it’s our Advanced Pick! As well as the Trophy Ridge accessories, which include a sight, a Whisker Biscuit and a quiver amongst others. it also has 11 great features that we have found in our research. This bow costs around $400.00. Due to its high price, we’ve placed it in the Advanced Pick category. It has almost everything, but it isn’t affordable for everyone and only the most experienced of archers should go for this product. For those with a real passion for archery, the price won’t necessarily be of big importance. Besides, you are also getting six great accessories that will inspire your archery experience. 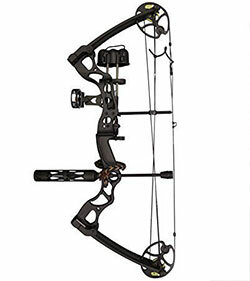 This compound bow has the second highest average user rating from Amazon in our Top Ten. There are around 40 reviews, which give an average rating of 4.5 out of 5. It has good review frequencies with the last 10 reviews taking place in 55 days, the previous 10 reviews in 57 days and the 10 reviews before that in 70 days. If we compare this to our Top Pick, we can see it has fewer reviews with lower review frequencies. This can be explained in two reasons: it has fewer reviews because it is a relatively new product on the market and also because only professional archers buy this bow. In terms of other reasons, this bow sets itself apart from others, the limbs are made from Endura Fiber. This means they offer controlled power. There is also a Rockstops offset string suppressor, which makes the bow silent and it doesn’t vibrate. 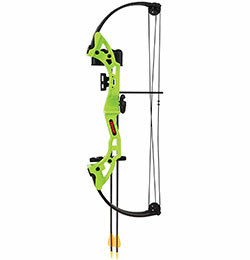 This bow really is a complete package with incredible adjustability. This is quite a light product that weighs 3lbs. The riser is made from aluminum and the limbs, Endura Fiber. It has both a string damper and rod damper. This is a great bow as it can be used by both left and right-handed archers. The bow has an average arrow speed of 315FPS, which, along with our Top Pick, is the highest speed in our Top Ten. In terms of draw weight, this compound bow can be adjusted to between 5 and 70lbs and has an adjustable draw length ranging from 12 to 30 inches. It has the second shortest brace height in our Top Ten, at 6.5 inches and measures 30 inches axle to axle. It also has a 70% let off, like our Budget Pick. Overall you will find it a great option if you have the technical know-how of archery. It has a sight holder and a stabilizer holder as standard. 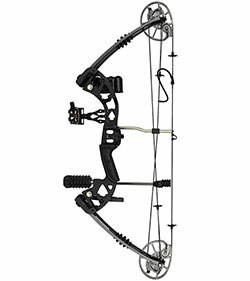 It has a 1-year warranty and costs around $400, which is why this is most suited to the professional compound bow user. This price makes it the most expensive in our Top 10. The average rating is excellent at 4.5 out of 5 shows that those who buy this product are happy with their purchase. 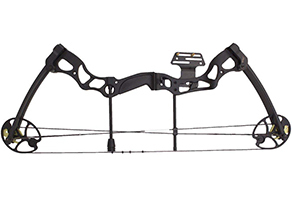 A great product for the professional, this compound bow has everything you need. The reviews speak for themselves too! Why is This Product Our Children’s Pick? This bow is the perfect tool for budding archers to like to learn the sport at a very young age. It has a draw weight and draw length that’s fit for smaller bodies, and comes complete with accessories. Our Children’s Pick is ideal for a pre-teen who takes Robin Hood very seriously, or a child who wants to learn archery at an early age. This is a great kid’s compound bow as it comes with all of the basic features that are necessary for a young person to learn archery. It is a children’s product that is not for adult use. This bow comes with two composite arrows, a 2-piece quiver, an arm guard and finger tab as well as sights and an arrow rest. For all of this, it only costs around $40, which makes it the best deal compared to other products for children in our short list. What is more, Amazon users give this an average rating of 4 out of 5, which is great. As far as review frequency is concerned, it looks to be a slower-selling product since it took 110 days for the last 10 reviews, 87 days for the previous 10 reviews and the 10 reviews before that took 45 days. However, this could be explained in that many people prefer to buy kid’s bow and arrow sets in a store rather than online. If we look at the number of reviews this product has received, we can see it sits at over 400. This gives us an indication of how many products have actually been sold and how popular the product is in spite of the lower review frequencies. Finally, this bow delivers a decent draw weight, which is fit for a child as well as a draw length that is suited to smaller bodies. It also has safety accessories that are ideal for developing proper archery skills, meaning that this compound bow and arrow kit is similar to using a traditional bow and arrow set. This is a bow made from composite materials for both the riser and the limbs. It weighs 3.3lbs and has a rod damper. It doesn’t come with a string damper, however. 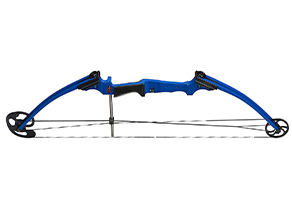 This is suitable for a right-handed archer and has an average arrow speed of 7FPs, which is the slowest in our Top Ten but not an issue considering this is a bow for children. It has a draw weight, which is adjustable between 17 and 21 pounds and a draw length of 26 inches. It has the largest brace height and axle-to-axle length of all of the compound bows in our Top Ten at 8 inches and 33 inches respectively. It has a let off of 65%. There are loads of accessories that come with this compound bow. All in all, you get 2 composite arrows, a rest, a sight, an arm guard, a 2-piece quiver and a finger tab. This means that this product is a great gift for kids as you don’t need to buy anything else. They can get started practicing straight away with this bow. Unlike most other products in our Top Ten List, this bow only comes with a 90-day limited warranty. It is, however, much more affordable at around $40. 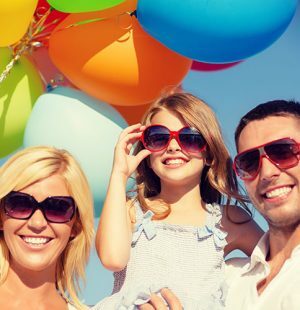 The reviews are really good and give an average rating of 4 out of 5 coming from almost 500 reviews at the time of research so it’s clear to see that consumers are happy with this product and its value for money. 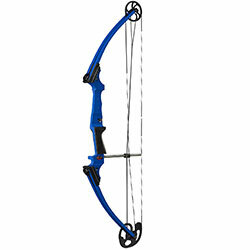 An excellent children’s compound bow; it is great value for money with excellent accessories too! I’m sure your young archers will be thrilled with this as a step into real archery. 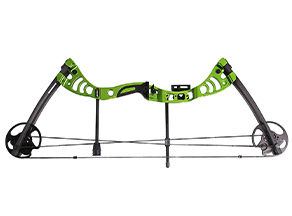 This bow is ideal for those who are into archery as a sport more than for hunting. 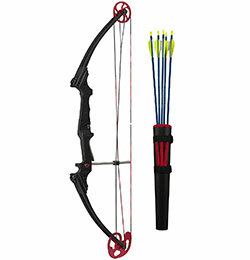 It’s heavy build, fast arrow speed, and adjustable length and weights make it great for target practice. At 4.4lbs, this is the heaviest compound bow in our Top Ten List, which could mean it’s more suited to target practice rather than hunting. It has a riser constructed from aluminum with ABS-constructed limbs. It has both a string damper and a rod damper. This bow is designed for a right-handed archer. It has an average arrow speed of 310FPS, which is almost as fast as our Top Pick. The draw weight is adjustable between 50 and 70lbs and the draw length is adjustable between 25 to 31 inches. 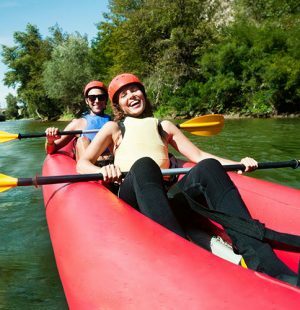 The brace height is on the larger size at 7.5 inches and it has the longest axle-to-axle length (31.5 inches) of all of the products in our Top Ten that are designed for adults. This bow does have a bow quiver holder but doesn’t have a sight holder or stabilizer holder. Warranty-wise, it comes with one year as standard. 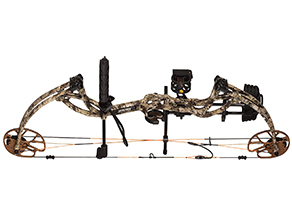 At around $300, this is one of the higher priced compound bows on our list but is definitely worth its price considering it comes with 12 positive features. It also has a very good average rating of 4.2 out of 5, coming from 163 reviews. The review frequencies are good too. A great product with very high ratings. If you’re interested more in archery than hunting, then this would be a good choice simply because it is quite large and heavy for discrete hunting. This bow set is ultra-lightweight at 3 lbs, and is the lightest in our top 10. It comes with accessories, with a draw weight between 15 to 25 lbs, and a draw length range of 13.5 to 19.5 inches. 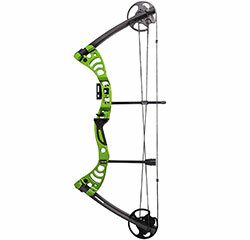 This is the joint lightest bow in our Top Ten at 3lbs and is great as a beginner compound bow or a youth compound bow. The limbs are made from composite materials and it has a rod damper. Suitable for the right-handed archer, the Bear Archer Brave Bow Set has a draw weight that is adjustable between 15 and 25 pounds, making it ideal for younger archers who really are familiar with the archery jargons. The draw length is also adjustable between 13.5 and 19.5 inches, making it perfect for smaller bodies. The brace height is the shortest of all of the products in our Top Ten at 5.5 inches. It is also the smallest compound bow in terms of axle-to-axle length at 26 inches. 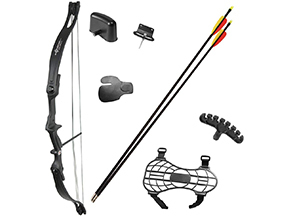 This compound bow comes with lots of accessories including a Whisker Biscuit arrow rest, a 1-pin sight, finger rollers, an arm guard and an arrow quiver. It also comes with two safety-glass arrows meaning you can shoot it straight away without having to buy anything else. It also comes in six different colors, which might be of interest to the younger generation. This product has a price tag of around $46 at the time of research, making it slightly more expensive than our Children’s Pick. It had 225 reviews at the time of research, which produced an average rating of 4.1 out of 5. It has good review frequencies too. 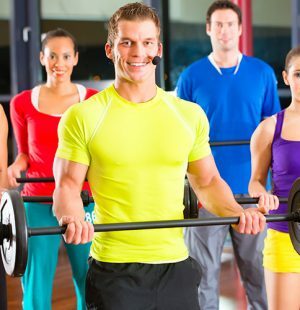 This is a great option for young people, although has fewer features than our children’s pick. This is great for people who want something for your kids, especially as you can customize the color. This bow is a bit on the heavy side, comes with adjustable draw lengths and draw weights, and is designed for both lefties and righties. It’s compact and comes with accessories that cross-country hunters will love. The SAS rage is the joint heaviest compound bow on our list, weighing 4.4lbs. The limbs are constructed from an ABS material and it comes with both a string damper and rod damper. If you need a left-handed bow, this one can be used by left-handed archers as well as right. It has an arrow speed of 270FPS, which is the slowest out of all of the compound bows in our list that are designed for adults. It has a draw weight of 55 to 70lbs and a draw length of between 25 and 31 inches. These are both adjustable. 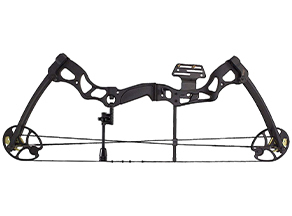 The brace height is 7 inches, which is the same as our Top Pick, and the axle-to-axle length is 28 inches, making it one of the more compact bows in our list. Just like our number 2 pick, the SAS Rage has a let-off percentage of 70. This bow doesn’t come with many accessories and has the second-fewest positive features. The riser has cutouts, giving it a waffle look. This compound bow costs around $140, which, taking into account its features, is a bit on the expensive side. The average rating of 4.1 out of 5 is really good and comes from almost 300 reviews. The review frequencies are good too. You get a 1-year warranty with this bow. If you’re left-handed, you might want to take a look at this bow. It has excellent ratings so if you’re not bothered about having lots of extra accessories, this would be a good buy. This basic bow with 0% let off is a great starter pick for beginners or intermediate archers. It fits both left and right handed users, and literally grows with the archer as he develops in his skill and technique. The Genesis Original Bow is a great beginner compound bow and so using this compound bow is quite easy. It weighs 3.4lbs and has an aluminum riser and limbs made from composite materials. It has a rod damper but not a string damper. This bow can be used by left-handed archers as well as right-handed. Both the draw and length weights can be adjusted. The draw weight has a range of 10 to 20lbs and the draw length can be customized to between 15 and 31 inches, making it ideal for both smaller-bodied and larger-bodied archers. The brace height is 7.5 inches. Axle to axle, it measures 31.5 inches. This is a great bow because it can be adjusted as the archer grows or develops their strength and technique. There is a 0% let off on this bow, due to its lower draw weight. There are no additional accessories with this bow, but it does come in a fantastic range of 12 colors! Given that this product has the fewest positive features in our Top Ten (7), it is quite expensive. It does, however, have an exception 4.7 out of 5 average rating and has over 340 reviews, which is our second highest number of reviews. It is safe to say, therefore, that lots of people are buying this product and that they are extremely happy with their purchase. This product comes in a great range of colors for the people who are interested in the aesthetics of the bow. However, this product does not provide any let-off, giving up the mechanical benefits that a compound bow is supposed to have. The Genesis Original Kit comes with an array of accessories that make it a great bow to use for starters, both adults and children alike. It also has 0% let off, and comes with an arm guard, five arrows, a tube quiver, and a hex wrench. This bow is pretty similar to our No 8. Product. It weighs 3.53lbs and has an aluminum riser and composite limbs. It comes with a rod damper but doesn’t have a string damper. In terms of orientation, this compound bow is suitable for both left-and right-handed archers. The draw weight is adjustable between 11 and 20 pounds and a draw length of between 15 and 32 inches. This means that children can’t outgrow this bow! It has a brace height of 7.5 inches and an axle-to-axle length of 35.5 inches. There is 0% let off, due to it already having a light draw weight. Accessory-wise, this is a kid product so it comes with a belt tube quiver, and adjustable arm guard and five aluminum arrows as wells as a 3/16″ Hex Wrench to make alterations. These additions make it a great purchase to be able to start shooting straight away. It also has a great color range. Although the Genesis Original Kit has 60 fewer reviews than the Genesis Original Bow, it still has the same excellent average rating of 4.7 out of 5. The review frequencies are also lower, which is why this product slipped one place below. This kit costs around $180, making it just over $35 more expensive than the bow alone, which is a great price when you consider the additional accessories you get. The average rating of this product tells you all you need to know. At 4.7 out of 5, you really can be sure that you’ll be happy with the Genesis Original Kit. Due to its draw weight and 0% let off, this is more suited to beginners and young archers, so professionals or more-experienced archers may want to choose a different bow. This bow package boasts of some amazing features like a wide draw weight and draw length range, and comes with an impressive array of accessories that are ideal for the more experienced and professional archer. 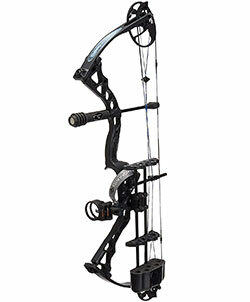 Our number 10 is the Diamond Archery Infinite Edge Pro Bow Package. The bow weighs 3.2lbs, which is one of the lightest bows in our Top Ten. The limbs are made from carbon composite and it has a string damper and rod damper. This is suitable for both left and right-handed archers and has a high average arrow speed of 310FPS. In terms of draw weight, this compound bow can be altered a staggering 65lbs – from 5lbs to 70lbs! Draw length-wise, it has an impressive 13 to 31 inches. The brace height is 7 inches and the axle-to-axle length is 31 inches. This bow has the largest let-off percentage of all of the bows in our Top 10, with a figure of 80%. This bow comes with a lot of accessories! It has a bow quiver holder, a sight holder, and a stabilizer holder. Furthermore, it has a 3-pin tundra sight, and extra-large arrow rest, a tube peep sight and a comfort wrist sling. 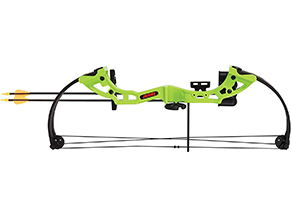 This is one of the more expensive products in our Compound Bow Buyer’s Guide, however, it is aimed at the more professional archer. It costs just under $310. The reviews are fantastic and similar to our number 8 and number 9 products, with an average rating of 4.7 out of 5. It doesn’t have as many reviews as those products, however, and the review frequency isn’t as good either. There is a 1-year warranty with this product. If the number of reviews isn’t an issue for you (after all, this product still has 162), then this would be a great package for an experienced archer. Its 4.7 out of 5 rating, means that customers are satisfied and the chances are you will be too! Draw Weight: This is the number of pounds that it takes to pull the bowstring to the bow’s maximum draw length. Draw Length: for an archer, this is the number of inches measured from the nock to the deepest point of the grip. For a bow, this is the number of inches that it can be drawn to. Bow Quiver: this is a storage place for arrows. Axle: this is the part of a compound bow where the wheels attach. Compound bows are often discussed in relation to their axle-to-axle length. This means that the bow’s length is measured without taking into account the diameter of the cam wheels. Let-Off Percentage: because of the compound bow’s use of cams, the draw weight is considerably lighter. The figure given as a Let-Off Percentage means how much lighter the bow is to pull to its draw length. For example, if a bow has a maximum draw weight of 70lbs and a full draw holding weight of 14lbs, it has a let-off of 80%. It goes without saying that choosing the best compound bow can be a difficult and daunting task as there are so many questions to ask and consider. Whatever your criteria, I hope we’ve managed to answer your questions and given you some options to choose from. Finally, there are some obvious safety aspects to consider when purchasing a compound bow that shouldn’t go unmentioned. It’s obvious that bows and arrows are dangerous, given that they are often used to kill animals. Therefore, the archer should never be complacent when handling a compound bow. After all, it is a deadly weapon and this must always be at the forefront of anyone’s mind when around bows and arrows. No mattter you own a recurve bow or a compound, bows must never be pointed at anything other than the target and shouldn’t be drawn until the target is in sight and in front of the archer. It is also important to shoot targets that are designed to withstand arrows being launched at speed. Homemade targets just won’t have passed the standards needed to be safe. The targets must also be placed in appropriate places where the arrows won’t be able to bounce back and cause injury to an archer or observer. Whichever compound bow you choose, we hope you have a great time honing your archery skills!